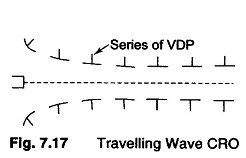 Figure 7.17 illustrates a High Frequency CRT. The vertical amplifier must be designed both for high B.W. and high sensitivity or gain. Making the vertical amplifier a fixed gain amplifier simplifies the design. The input to the amplifier is brought to the required level by means of an attenuator circuit. The final stages is the push-pull stage. The LF CRT is replaced by an HF CRT. A probe is used to connect the signals, e.g. a high Z passive probe acts like a compensated attenuator. By using a triggered sweep, for fast rising signals, and by the use of delay lines between the vertical plates, for improvement of HF characteristics. 5. New fluorescent materials that increase the brightness of the display are used.